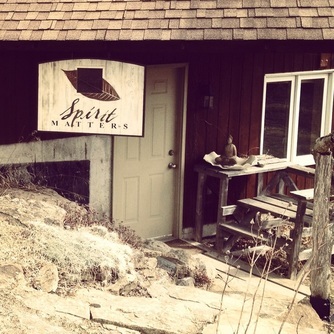 Owned by Julie & Stewart Yeaman, the Spirit Matters Centre was created to be a resource for personal growth techniques and to provide a place to share ideas about living together with intelligence, humanity and community. It is the home of Bloomfield Farm. Click here to find out more about Spirit Matters. A recent transplant to the Ottawa Valley, Rebecca started Bloomfield Farm in March of 2013. Much of her work has been guided by her interest in how food makes it way from farm to fork. Her first experience farming in Italy ignited a deep passion for righting the path of our food system, and connecting people to the sources of their food. 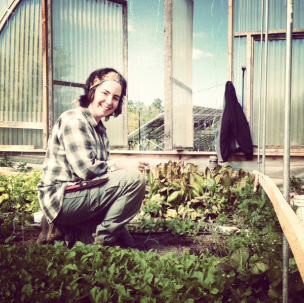 Rebecca has farmed in Connecticut, taught at The Edible Schoolyard in Berkeley, CA, managed a year-round CSA at Michigan State University's Student Organic Farm, and managed MSU's Organic Farmer Training Program. 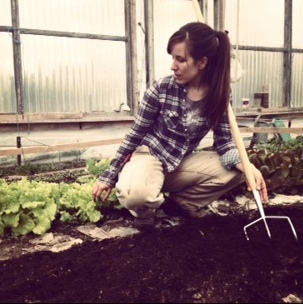 She is extremely grateful for this opportunity to grow food & build community here in Almonte. A native to Almonte now living in Lanark Highlands, Cassandra feels that it is her responsibility to know how food is grown. When she is not managing produce at Foodsmith's in Perth, she is lending her skills, hard work, and enthusiasm to Bloomfield Farm for the second year in a row. Our first season would not have been the same without her, and we are so grateful to have her on board for 2014! Cassandra lives with intentions of learning a sustainable way of life, and loves providing a nourishing food source for her community.